Okay Forum. I decided today I want to send a postcard out to, obviously, try and make more money. It's from a JVish deal I put together that hasn't gone as well as I hoped. I am willing to try this out and see if I can make some money off of this thing. This is going to be sent to insurance agents. They all have to do continuing education every 2-3 years but usually every 2 years. The bullet points were given to me by an insurance agent who rejected the first offer we had because it didn't answer all his questions that these bullet points answer. He was helpful enough to give me a critique. FYI I need to pull 1.2% to break even. 2.0% would be a home run. Also, I am planning on sending 1,000 of these on 4.24 X 6 postcard. Please any help is appreciated. I am laid up after surgery and would love to find a new income while I am still recovering. I would work on maybe getting a design off of Fiverr or odesk. That way it looks more polished and it gets a higher response rate. I mightn't be able to offer any advice in regards to the design or message of the card but I took a look and then I thought I better find out what the Insurance CE is all about so I googled "what is an Insurance CE course?" First few results were from a CE authority course site. I've pasted a graphic below. The thing I noted was they offer courses for $19.95 so it was less than the $34.99 you were saying was less than the average course. The other thing that bugged me was the combination of the offers. Firstly someone wanting business cards may not need the certification so why bother. Secondly if you needed the CE wouldn't you already have a place you went to to get them in the past and if your required them now you would already have booked and done a course. It also felt strange to have a physical offer and a bonus for the digital course. Maybe it is me but if I was registering for a course and they gifted me 500 business cards it seems like a better offer than the other way round. "Free" always gets people looking for "where's the catch?" I'd sort of expect a stronger headline maybe fear based and then offer the solution. That or just make an offer related to business cards. It doesn't work for me. On CE Authority - I actually talked to them about doing this with me. They charge $19.99 per course and at least 3 courses are needed to reach the 24 hour requirement so they are at least $60.00 so I have them beat on price but I'm obviously having trouble communicating that on the card. On not needing the cert and the cards at the same time - That's a very good point and I don't have a great answer for that. I am looking for a list of agents coming up against their CE requirements but I haven't found it yet. Most states require continuing education every two years and most agents do it in a near panic up against the deadline. I guess my answer would be if you need one or the other it's a pretty good deal to hop on. You have two years to complete the course and you know that you are going to need the course in the next two years. That's as good as i got so far. On giving away the cards with the course - I think that is a good idea. Perhaps I'll see if I can go that route. The issue I have with that is more logistic as I am fulfilling the cards and I want them to buy from me. If I can find a list of agents that need CE then I think your idea would definitely pull better than offering the course with the purchase of the cards. You've given me a lot to wrestle with. Thank You. Business Cards or Insurance course? I think you're really selling a trip to your website. And nothing on that card is compelling enough to make me stop and go to the website. Perhaps think in terms of Ewan's ad, "Warning don't buy business cards until you get answers to these 5 questions" or "Warning don't buy an Insurance CE course until you get answers to these 5 questions". Or maybe a question, like "Are your business cards driving customers away?". Something compelling enough to get someone to drop everything and go to your website. If you're offering a bonus, you need to sell that just as much as the main product/service. Benefits: To me, these are answers to questions which haven't been asked. It's more compelling to state the problem first, then agitate the problem, then provide the answer (the benefit). Damn near impossible on a postcard, so focus on getting them to the website, where you then have plenty of space. Are you brokering a deal between two parties or do you sell business cards or insurance courses? "What are you really selling?" - I think I'm selling the course as it stands. Most of the feedback I got from agents were questions regarding the course. The bullet points answers the questions I got. But I see that my selling of the cards is now lacking. "I think you're selling a trip to your website" - That's something I haven't considered. My thought was it's a fairly cheap, straight forward offer that doesn't need more steps. You've given me something to think about and test though. In your experience would people go to a website just to learn more about a $40.00 type offer that is a fairly routine purchase (once every two years in this case)? I am fulfilling the cards and found a partner for the insurance education. I am putting up all the money. Even with just business cards, having them on a list gives you more than one chance of a sale... And it's repeat sales that'll make you the most profit. In your experience a two step system where they are giving me their email and then selling the course and the cards is going to end up with more customers than a straight up offer? Or is it more the value in having a list of subscribers that could then be monetized? However, understand if people are buying business cards from you once every six months, they won't want to hear sales pitches for more cards from you in the intervening six months. You'd need to find reasons to keep in touch that are interesting and not just sales pitches. That's really what makes the difference. Not so much an "or" as an "and". Making offers of other people's products and services, in addition to your own, means more profit per customer. And you have no fulfillment costs. And if this is done to help then, rather than just sell something, then it makes you stand out from the rest. And selling business cards, you've got a foot in the door to many different businesses. You just have to make the connections. With a profit share, you don't need too many deals to make a lot of money. Too much niche jargon and all over the place. You'll lose some traffic by telling them they have to buy business cards. They won't even visit your site. Tell them about the purchase after they optin, that way you get a 2nd chance at conversions later on and still get their contact info. On the card, say Learn how to get a free CE. I have no idea what CE is or isn't. Anyways, this gets traffic to your site/optin. You've already payed for the traffic (postcard expense) so up the odds traffic will visit your site. NEVER give all the details upfront! That little bit of mystery is enough to get traffic asking you questions. I see you and Animal are thinking in the same direction in getting people to a website. I am ruminating on this. Thanks to all the feedback I now have at least two more things to test. I've been doing the same thing on Craigslist for a few years. Create the ads, and only give out enough info. (facts) in a bullet list to get people to ask me relevant questions. This turns the table and makes easier sales because now traffic is interested on their own terms and not being forced a sales pitch. The key is to get people talking to you. It works. Example, your postcard includes a price. I would never show the price on an ad because now traffic has enough info. to make a decision. If there's no advertised price traffic has to communicate with you before they can make that decision. Set traffic up and put them in a position to be curious. I stumbled onto this technique by accident a few years ago from testing different ads. It's extremely simple and it gets good results. I can usually get 50 - 100 contact info. per CL ad without any bumps and targeting smaller towns for both service and product niches. That sounds interesting. I can't picture exactly what your technique looks like, especially the "getting them to talk to you" part. As far as agitating the target - I don't think continuing education is really scaring anyone. "Renew Your License" sounds serious. - Only 1% of insurance agents make more than $100,000 a year. That's what I have so far. My initial concern is that I am getting pretty far away from my offer by going this route and that I am going to add a lot of complexities. I have been able to find lists of agents by month of license renewal date for some states so that's good. A better headline would be something like, "5 Mistakes Insurance Agents Make When Renewing Their License"
The word "mistakes" makes the reader think, "I'd better check to make sure I'm not making any of those mistakes". My initial concern is that I am getting pretty far away from my offer by going this route and that I am going to add a lot of complexities. To crack this market, you need an angle (mechanism) that separates you from the competition. These days, in many markets, it's getting tougher and tougher to find new angles. If you can't find one, you'll need to move on to Schwartz's final stage of market sophistication: identification. What's wrong with "niche jargon"? That's how insurance agents think and speak. The postcard title includes an acronym. ...and just because someone is working in a niche doesn't mean they understand all of the jargon. If someone wants something for free, odds are they're new to the niche. If they were already successful they'd just pay for whatever OP is giving away and skip the hustle. Seriously, it's a $35 sale. If I'm already established odds are I already have business cards. You didn't know what CE means. I didn't either. Many years ago, I held a P&C license, and one of the things the full-timers used to grouse about was "wasting valuable selling time sitting in a classroom for their Continuing Ed requirement." This was before there was such a thing as online education. Or "online" anything for that matter. Another thing. This may be one of the ideal times to use the old school e-newsletter or ezine. Since, as you say, most agents have to meet the requirement only every two years and usually do so at the last possible moment, you only have about a 1 in 24 chance of hitting an agent when they need the CE course. If you had them on a newsletter list, you could reach out and touch them once a month with useful content and your offer. > Short article on sales or marketing (hint: how to get more value from business cards for one). > Round up of industry news, interesting tidbits, etc. Four or five links would be enough. > Blurb about some aspect of the CE course, along with a reminder of your offer. Do this right, and your odds of hitting agents when they need either more cards or CE hours goes way up. I dig the benefits. Good job. I'd skip the stock Canva font - may be first one available when you log in - to go for a more bold but clean font. Insurance agents who buy biz cards and other printing? 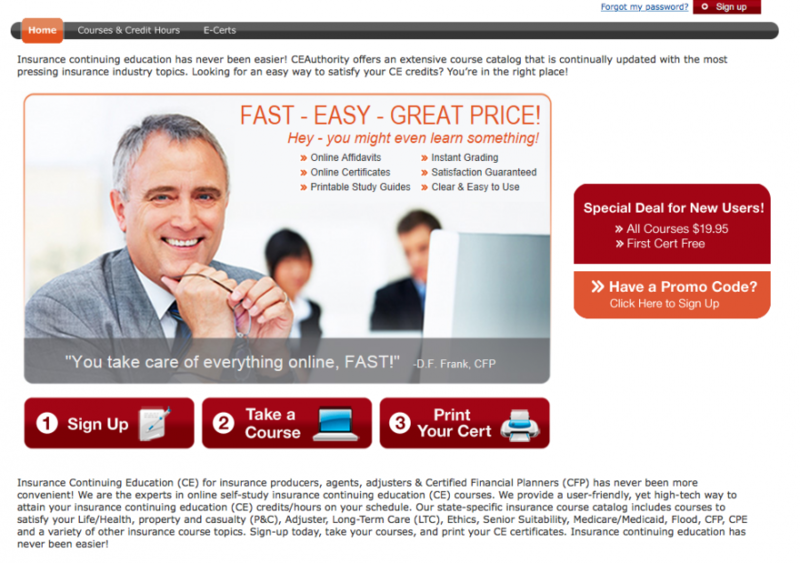 Insurance agents buying ongoing training? Cards and other printing services. Insurance agents probably spend close to twice as much on cards alone than on CE. to keep the message simple? Say offer 100 at your cost price. in which case that's where you make your profit. Volumepress is a trade only printer which has the best pricing and service I've seen around for printing. Last week alone, there were 531 new insurance agents started their biz across USA. Better yet eccj... why don't you offer high-ticket coaching instead of a low-priced info product? If I go the Animal "get them on a list" route I will since I will need other things to sell other than my services. The continuing education certificate isn't an info product though. It is state required education that all insurance agents must do every two years. That is why I think it may be a great bonus for this market. But now that I am cooking up a more lead gen type approach where they get on a list and then I sell other products, I think a coaching system would be perfect. I wouldn't do the coaching, for a multitude of reasons, but there are plenty of people out there who would. The course offer is weak, though. Most of them will ignore it till they are close to the deadline. At least in my part of the world, all of them have the same deadline for the continuing education. If they have to have it by the end of December 2018, most of them would bother with the CE in the 2 or 3 months preceding the deadline. If you have them on your list, you could push the CE starting August, in my example, and it would benefit you. Pushing it in, say, February, will just create waste. The idea is to sell 500 business cards for $X and the CE testing is then " Free "? So you are front loading the offer to pull your " Commission " correct? Why not just charge $10? Assuming my assumption is correct... I would... create 2 mailer types... one for the agency and one for the agents. I would then bullet the benefits. full required testing at our low discounted price. testing available 24 hours a day with the use of our partners online testing technology. Can take as long or complete as quickly as needed. how you could collect data from YOUR site and then pass this to the testing site would make the whole thing that much more legit... It can be done.. you just need a coder to make this happen. You could jack the $10 to $19.95 or even $24.95 and I am sure blow the offer out of the water. Maybe look to JV with an APP builder that could build a simple app for the Agency owners to keep track of their agents renewal dates, with a quick push notice of upcoming agent renewals that need attention. Developing value for the agency goes a long way in developing business from the individual agents. The idea is to sell 500 business cards for and the CE testing is then " Free "? Yeah on my side of things I am throwing in the CE for free with the cards. I have the deal with the CE company. I've had success selling this thing locally over the phone. The thing there is that I am talking to the receptionist and it's a good enough offer to explain in a couple different ways to get the point across. The thing I would like to figure out is how to do this without me being on the phone or hiring people as the upside is not high enough for that. I could make a decent living calling people all day with this offer. It was never my intention to make calls but just a quick way to test out if anyone wants this offer. On the phone I do a short introduction, say I have these certificates for the CE, ask if they have anyone that needs CE, ask if they need any printing, make some suggestions on what they should do. The crazy thing is that this works pretty well - it's a money maker for sure. Now how to get this all across through other means. I did something that didn't work well - so now I'm looking at more conventional means. Free CE is a seller in the insurance agent world. Insurance companies use it all the time to get in front of agents. So "FREE CONTINUING EDUCATION" seams like a good lead in for a post card. I'm waiting to pull the trigger until I have the timing part down in this. Free CE is pretty strong when you are up against the clock. It also serves as a reminder that you need to get CE before you lose your license. When I had my license, I would get postcards from a company that had my name on it with the offer of "24 Hours of CE $39.99 Was $60.00" with a website. That postcard is still mailing to my knowledge. It must be worth it to them. What's the deal with the cards? I know you said you are selling them and that agents spend more on business cards than they do on CE. The offer seems very muddy to me, and as such, I would likely pass on it. Another thing (and I'm saying this as kindly as I can) - IF I were looking at getting business cards, I would be viewing the postcard as a sample of the cards you might produce. As such, the postcard you've submitted here wouldn't make me want to order business cards. There's an excellent book by Michael Masterson and John Forde that I am reading that reiterates the importance of one main idea per promotion. To do this, you should know your audience well. Yet, when someone asked what you were selling, you said, "I think I'm selling the course as it stands. Most of the feedback I got from agents were questions regarding the course. The bullet points answers the questions I got. But I see that my selling of the cards is now lacking." That seems to me that you are not quite clear on your market and what your offer is. What is your background, if you don't mind sharing? How did you decide to link business cards and CE together? It will almost certainly pull better at getting people on a list. It will almost certainly make me less money up front but that is okay for a few reasons 1. I don't need the money 2. It will increase my mailing universe to once every two - three years for veteran agents to virtually all agents no matter their line of insurance 3. The amount I would make in a good scenario wouldn't be worth my time, at least at this point in my life, by mailing to a smaller universe. I'll be sure to update this later when I get some more time. A little more polishing in my personal opinion. There are many cheap-but-good designer on Fiverr. Go to Fiverr and find someone. 1. My mailing universe isn't as big as I first thought. Returns were good enough on expiring licenses but not agents in general. That means a few big things: mailing to general types of insurance agencies isn't profitable and mailing to agents who are more than likely going to wash out isn't profitable either. That's a huge chunk of the agents. 2. The mailings on their own are not home runs but more like base hits. It's going to take a lot of work to make it a big deal. So the thing for me to do now is decide what to do from here. It will be more of a personal choice than a business choice.